Frank YangI had planned to lead off by saying that if there was one silver lining to Apple’s completely FUBAR-ed redo of their Music app in iOS7, it was that its insistence on playing all albums by an artist in sequence, ignoring the end of one album and the start of another, it was that I’d be able to listen to The Deer Tracks‘ Archer Trilogy as a single entity, uninterrupted by flipping vinyl discs and sides. But as it turns out, for whatever reason, my iPhone insists on sorting them in order of volume 1, 3, and 2, so that doesn’t work. Screw you, Apple. But even if it takes a few more clicks or flips than ideal, it’s something to be able to experience the work as a whole. The expansive, uplifting moments crafted by the Swedish duo of David Lehnberg and Elin Lindfors that initially hooked me have lost none of their impact, but the spaces in between really do pull the over 100-minutes of grandiose synth-pop together and even if you don’t fully understand what it’s about – though there is a narrative – you certainly feel it. And though it’s not reasonable to expect the full scope of the work to come across in a live show, as evidenced by their local debut last June and their return visit nine months to the day before this last one, they certainly make a go of it. There was some interesting local support on the bill for the visiting Swedes, starting with the deVah Quartet – a modern take on the classical string quartet combining electric instruments run through serious pedalboards and amplification, backed by a hard-hitting drummer, and boasting Varvatos-approved rock’n’roll style. So by the criteria of not sounding like every other band, they’d already won. And while not the most convincing rock singers or songwriters, they more than compensated with top-notch performance chops and arrangements. I couldn’t say who their audience is going to be – the connections between classical and rock are hardly unexplored but not often from this direction – but if and when they find them, they’ll be golden. Swinging way back on the conventional side of things were Falls, who wanted nothing more than to be a radio-ready alternative rock band, and in that, they were successful. They were solid players and a tight unit – impressive considering their bassist was a substitute – but those positives were undermined by the general over-emoting and other such tropes of radio-ready alternative rock, perhaps best captured in their unnecessary and un-nuanced cover of Chris Isaak’s “Wicked Game”. But unlike deVah, I know exactly who their audience is and they’re out and are legion. And so it goes. There’s not that many ways to re-configure a duo, but somehow The Deer Tracks have managed to bring a different markedly different show to town three times now, in the past year and a half. After performing as a four-piece with touring keyboardist and drummer the previous two times, they were now a three-piece set up amidst a jungle of cables, stands, and LED lights, with Lehnberg assuming drum and percussion duties; this was after doing guitar/keys/vocals duties the first time and focusing on synths last time. The net result of this reconfiguration, plus the necessary translation of the recorded work into a condensed live show of highlights, was a more percussive, visceral, and dramatic reading of The Archer Trilogy than one might have expected. Yet it did this without compromising the whimsy and delicacy of the material – this end of things remained well intact thanks to Lindfors’ vocals, as well her work on keys, saw, and melodica. The band’s resolutely DIY ethos is well-known to anyone who’s followed the band; the same drive and passion that compels them to create multi-part musical epics and undertake extensive international tours to slowly but steadily grow their fanbase also allows them to imbue something genuinely transformative into their performance. As in February, there weren’t a whole lot of people there but those that were got to experience something special. AlbumStreams have a stream of the new live Nick Cave & The Bad Seeds record Live From KCRW, which gets a proper physical release as of today. They’re in town at The Sony Centre on July 31. 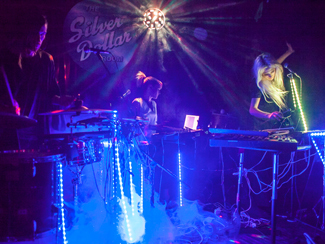 Holograms have released a new video from Forever; they’re at The Garrison on December 8. TwentyFourBit has got a stream of José González’s contribution to the soundtrack of the new Secret Life Of Walter Mitty film, which opens Christmas Day. Exclaim has details on Sigur Rós’ attempt to make Christmas shopping easy for the Sigur Rós fan in your life – a nine-disc vinyl box set of their last album Kveikur, which features each track of their album on an individual 45RPM 12″ with an instrumental mix of the same song as the b-side. And the set is now sold out, so this entire paragraph is moot.